Kidztrix Workshop Program provides school age children an opportunity to be inspired by and learn with professional and acclaimed teachers of the creative and cultural arts. The program has drawn on Local and Sydney Teachers to make available to the children and community a highly qualified body of proffessional facilitators with extensive experience in their field. Included in the series of workshops will be: Drumming, Kids Yoga, Hula Hooping, Indigenous Education, Circus Arts, Screen Printing, Martial Arts, Circus -Yoga and Environmental Sustainability. This is a community non for profit project designed to build up awareness and access to the Healing, Creative and Cultural Arts on The Central Coast. By making available to our children in regional communities, a diverse array of learning experiences, horizons and opportunities in life are broadened, and our sense of "Australian Culture" is enriched. Come and be a part of this development! Zoe Braithwaite of Outrageous Entertainment is a qualified Yoga Teacher with over 12 years international experience in circus performing and training. Zoe is commited to bringing the disapline’s of Yoga and Circus together to create a nourishing and playful art where strength, flexibility and self awareness infuse the fun, wild and extraverted world of dynamic play. By conditioning the body in alignment, the mind in focus, children are stimulated while staying calm; reducing the risk of injury and increasing respect for themselves and others. By combining the physical alignment of Yoga with the fun and playfulness of Circus, Zoe presents a highly unique and integrated workshop. Circus Skills include Acro Balance, Tumbling, Theatre Games, Balancing, juggling, Hoops, Counter Balance and poise. Skilled in Stilt Walking, Stilt Acrobatics, Costume design , Juggling, Capoeria, Balloon Bending, Dance, Acro Balance, Fire Dance, Butoh, Face Painting, Clowning, Hat Manipulation and Yoga, Zoe produces innovative stage shows and interactive concepts for adults and children in a variety of settings from community to corporate. Zoe has performed in London, Portugal, Spain, France, Hong Kong, Ibiza, Malaysia, Singapore, Middle East, Hungary and Australia with client’s such as BMW, ING, Amnesty International, Samsung, Porsche, Foxtel etc. Please check link to “Zoe Be” and “Experience” under “About Us” on this website for more info. Hooping is a unique way for children to connect with their individual sense of rhythm, strength, coordination and confidence in a group environment. In creating a learning space to try something different while being physically active and creatively expressive, we encourage children to explore new ways of exercise and movement that involve fun, play and dance. Drawing on the inspiration and skills of both the circus and dance arts, we offer workshops where children learn a variety of tricks from the very basic saves and turns to more advanced technique and hoop dance moves. We encourage children to take this timeless toy and exercise tool further, to see how it relates to their body and their developing sense of movement. Bunny Hoop Star is the Director of Hoop Empire. She is a multimedia artist, hoop teacher, and founding member of The Hoopaholics- Australia's one and only hulahoop troupe. She has been hooping for over a decade and now performs and teaches in Australia and throughout the world. Her training includes classic circus hoop technique, American Hoop Dance, Nia Technique /Spirited Movement, Yoga and self-directed dance land groove. With an emphasis on movement and flow her classes range from learning the basics of how to spin a hoop or two... or three or four... to more advanced Hoop Dance moves. She has been teaching the hoopla to both adults and children over the past three years and is accredited with the Australian Sports Commission. Sprouts Kids Yoga classes encompass stories, songs, rhymes, movement and dance to deliver the joy of yoga to children in a very fun, dynamic and creative way. We combine postures (asana), meditation and relaxation, Pranyama (breathing) and art activities to allow each child to shine their own inner beauty and individuality. An awareness of the body and physical strength is established and special emphasis placed on positive thinking and mental focus. 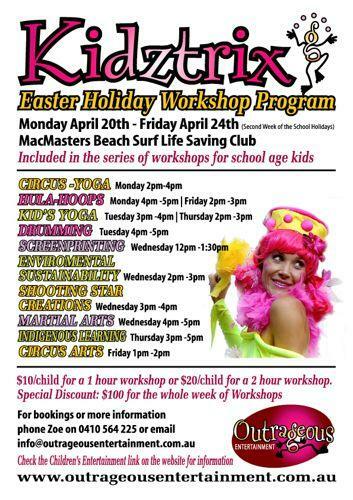 Its all about fun and laughter with Sprouts Kids Yoga, and a class that nurtures your child's mind, body and spirit. 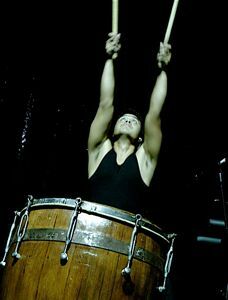 Rendra has been Inspired by Japanese Taiko and remote music from West Sumatra, Indonesia. His group, The Rhythm Hunters fuse the thunder of taiko drumming with indigenous Islamic music from West Sumatra. Taiko, frame drums, kettle gongs, bamboo flutes, didgeridoo, log drums and West Sumatran folk songs are woven into a dramatic visual spectacle. Escape to long echoes in hidden valleys of laughter, primal ceremony and the beat of a lone drum. Rendra Freestone is raising the profile of Sumatran music with this dramatic fusion. Their performance also presents as a visual spectacle with dynamic physical action on stage including dancers, didgeridoo, harmonium, vocals and big spirit. Nina has demonstrated and consulted on specialist screen printing and airbrushing techniques for professional organisations and the garment industry in Fiji and has taught in primary, secondary and tertiary institutions in metropoitan, regional and remote parts of Australia, the Pacific and Greece. With vision and dedication, Nina’s work is as diverse as the demand, whether it be founding community festivals, setting up screen-printing enterprise projects, city and town banner projects, as artist in residence in schools or making community storybooks. 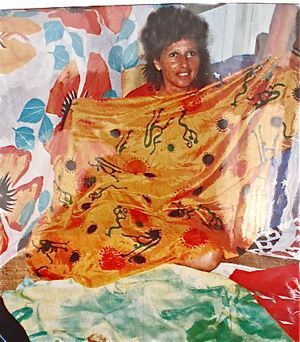 Nina’s work and her contribution to community and culture has been recognised in a range of honours and awards. She has been a member of the Commonwealth Regional Art Assessment panel assessing applications for grants to the visual arts for five years. Nina's philosophy is that art should be accessible to all people to create and to appreciate. She believes that play is important to people of all ages and combines these principles in her work and her life! She likes her art to be used, worn, slept on and eaten off - a part of every day living. TO REMEMBER: Children will need to bring their own pillow case or t - shirt to workshop. T-shirt needs to be a pale colour with no pockets/buttons/infingements on it. 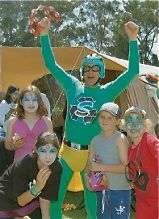 SupaCycla is a superhero with great power to create interest, awareness and ACTION in sustainable living. He represents SupaCycla.com. He also represents the idea that the Super Cycles of the Universe are the natural state of existence, and that human beings need to get with them and create practices that allow what is here today to be here tomorrow. He is a real life SuperHero who goes to festivals, events, gatherings, schools - anywhere his presence can make a difference. SupaCycla sings songs about recycling and reusing and sustainability. He makes people laugh and involves children and teenagers. non violent exercises, that teach kids to recognise and avoid danger, while centering the body and focusing the mind. 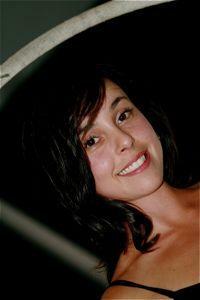 The workshop will be taken by Scarlett who has had ten years martial arts experience. She has been mentored by some of Australia's best Martial Arts instructors, and has taught at some of Australia's leading schools including Black Belt Martial arts - Gosford NSW, Success Martial arts- Lismore NSW, Family Karate Center New Jersey - USA. Director" of the year, 2004, awarded by the Educational Funding Company ofthe USA. Since 1999 Phil has devoted much of his time working in community focussing on community development and relationship building, environmental awareness and spiritual connection to land, and youth. He was a founding member of the Ourimbah Protocol in 2003, which facilitated a partnership arrangement between community and State Forests of NSW to co-manage forests on the Central Coast and Hunter region of NSW. 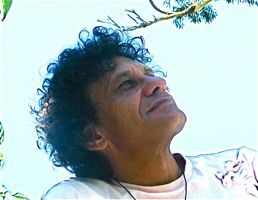 Around the same time, he established the Earth Light Project in partnership with the Anglican Parish of Gosford, to “cultivate Indigenous wisdom and spirituality for the benefit of the community.” He is a Director of Pacific Link Community Housing and also works towards reconciliation as an Aboriginal consultant for the Gosford City Council, through his involvement in annual community events such as the ‘5 Lands Walk’ and the Australia Day Lantern Procession at Woy Woy. Phil has a Bachelor of Arts Degree from Charles Sturt University with majors in Economics, Sociology and History. Phil Bligh has worked as a consultant and policy officer within Aboriginal Affairs, with the Darkinjung Local Aboriginal Land Council, the NSW Department of Aboriginal Affairs and the Aboriginal and Torres Strait Islander Commission (ATSIC). This Workshop provides an interactive sensory experience including Storytelling, Traditional facepainting with ochres, Bushtucker, and Dance. Children are Educated in sharing their unique gifts with the world, while respecting themselves, eachother and environment. Leo Bonne, originating from France offers a unique workshop involving a show style demonstration with a wide range of juggling props including: clubs, balls, bouncing balls, devil stick, cups, spinning plates etc...., followed by question and interaction with time with Leo and the toys!!. Leo Bonne studied at the Annie Fratellini Circus School in Paris. He performed with a troupe called “Les Cracheurs De Reves”, specialising in themed soirees and seen at such prestigious events as the Cannes Film Festival. 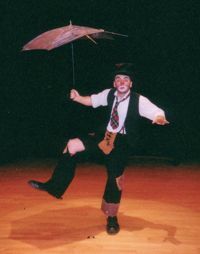 Since arriving here in Australia in 1995 Leo Bonne has been performing both solo and in group collaborations as a juggler, clown, mime, unicyclist, comic waiter, physical comedian, stilt-walker and fire artist. Since living in Australia Leo Bonne has also travelled to various places to perform, including; France, New Caledonia, Indonesia, Taiwan, Qatar, Dubai, Hong Kong and Singapore. 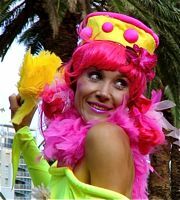 A master of both interactive roving and stage performance, Leo Bonne has appeared in fashion show parades, cabarets, corporate functions, sporting events and street fairs and festivals. T.V. commercials and films that Leo Bonne has worked on include; Yoplait, Star City Casino, Sony, Splenda, Mission Impossible 2, and Wilful. Leo Bonne is an expert juggler and can juggle clubs, fire torches and fire balls, knives, crystal balls, hats, bouncing balls, cups, plates, umbrellas, tennis racquets or anything else you care to think .